Tuck, our 11 1/2 year old, 40 pound vizsla, is no longer able to keep up with the rest of the pack on walks, due to some health issues. Not wanting to leave him at home, we searched for a dog stroller aka “the sag wagon” that he could ride in when he ran out of steam. After much research, we decided on the Pet Gear Expedition Stroller. 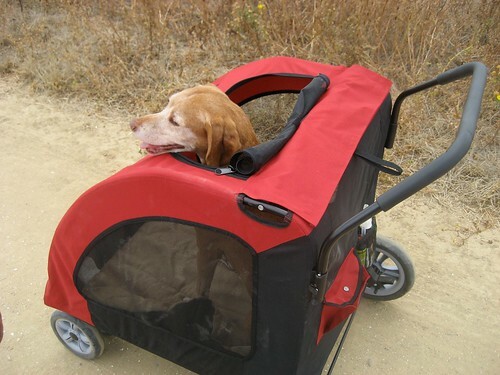 First of all, although there’s plenty of strollers to choose from for lap size dogs, it’s much more difficult to find a stroller for a larger size breed. This stroller is plenty big enough for Tuck, as well as being able to carry some additional supplies. The Pet Gear Expedition Stroller is quite sturdy and well built. It folds down pretty easily, but in order to get it into the trunk of my compact Mazda 3, I have to also pop the large rear wheels off. Not too hard to do, just push in the center of the wheel and slide off, but it is another step. The empty stroller weighs 33 pounds, but to be expected from a stroller that can carry up to 150 pounds. The stroller works well on hard packed dirt off road trails, but is not easy to roll in loose sand, like at a beach. The front wheels swivel, but can be put into a locked straight position if desired. The “brakes” can be set by stepping on the tabs near the rear wheels. We like to put a travel size soft bed in the stroller for Tuck to sit on. Tuck enjoys riding with the top and front mesh areas unzipped (side areas do not unzip). There is also an adjustable nylon strap that you can attach to your dog’s collar. 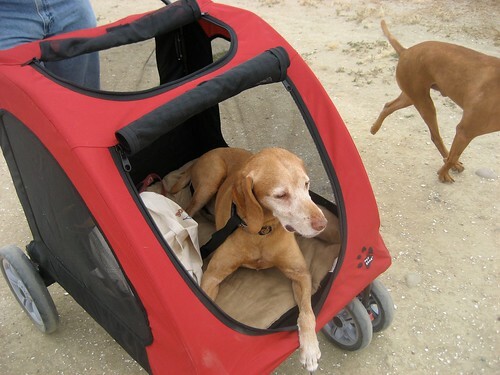 This works well for preventing Tuck from suddenly jumping out and hurting himself as the stroller is moving. When Tuck has rested sufficiently and is ready to walk again, he lets us know with a whine, and we stop and let him out. Having a stroller sure beats carrying a 40 pound dog! Having carried the 40-pound Tucker halfway up a mountain outside Julian when he first got sick, I would have to agree with that last sentence. That looks like a fun way to travel when necessary. I love that review, and it helps me out a lot. I think it would be good for a certain aged Greyhound here, although I’m not sure if her pride will let her admit that she needs it. Yeah, Tuck doesn’t like to admit he needs a little help, but eventually he’s so tired that when I pick him up and put him in it, he settles down quickly for a sightseeing ride in the stroller. Our Golden Retriever can not sit for long due to very weak back legs so we need a stroler big enough for him to lie down in. Is the internal length of the cabin 42inches o is that an external dimension? I believe it’s an internal dimension. This is the roomiest stroller we have found. We put a roll up travel bed in the bottom, and it is quite comfy. I think Cougar would like it. Are you mostly walking on pavement? It is easiest to roll on pavement, especially with a large load in it. Yes, the length is 31.5 inches. I am a little confused though. Did you mean that your stroller was shorter than that? My stroller is currently in the trunk of my car and things have been very hectic lately . Sorry I haven’t been able to get out and measure it for you. It’s pouring rain outside, so perhaps when things are dry again, I’ll be able to take a look at it. Hi Kelly and Dennis, sorry I meant that when I ordered it it stated that the interior was 42 inches long 25 inches wide and 38.5 inches high, but when it arrived that was the overall length of it, which made it a lot smaller than what I was expecting I contacted the seller and explained that they should advertise properly the size as I purchased it thinking I had a lot more room for Cougar than I actually did, and at first had a lot of trouble getting her in but she seems to had adapted to it and likes it now a lot so its turned out ok as I thought I would have to sell it on and would be without a stroller for her, So it has all turned out Great which is good, and Cougar will be able to be mobile for a long time yet, I hope your Tuck is also going strong take care. I’m glad that Cougar can be a part of walks again! Does Cougar like riding with the mesh rolled up so she can have a better view? Tucker’s birthday is today (Halloween). He is now 12 and doing pretty well. When I went on the pet gear site it stated that the interior pet compartment on the expedition was 32 long X 25 wide X 24 high. I know that you all are using it for a large dog but do you thinnk it would be good for 2 miniature poodles and a toy poodle or is it overkill? I think your crew would be very comfortable in it, ample room for all. 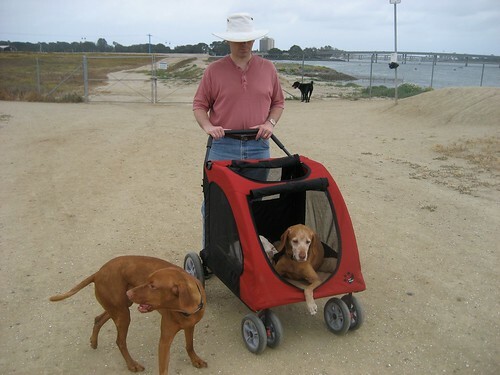 I’m not sure if there is a slightly smaller stroller that would also meet your needs for all 3 dogs to be together. If you have a large enough vehicle to comfortably carry this stroller, and if you are going to be on pavement or hard packed dirt, then having a little extra room for everyone would probably be appreciated by your dogs. We found it helpful to order our stroller from PetSmart on-line because then if we didn’t like it, our local PetSmart said we could return it to them, instead of having to ship it back. Have just started looking into strollers for my large female Greyhound. She had a back leg am[utation last week but I want her to be able to stay active. She also does therapy and don;t want her to get tired juts walking in from the parking lot. This review was very helpful since I seemed to think the design was better in this stroller for easy in and outs. Some of the others with 3 wheels, seem to have quite a big step up to get in. Will start saving to get this model. Thanks for the great info. I live in the UK and have read your reviews with interest and am thinking of getting one of these great strollers. However, no-one supplies them here! I have contacted Petgear direct who can send me one. Can you tell me (before I spend over £150) if after a year the stroller is still “as good as new”? We haven’t used the stroller on a regular basis, but I think it’s put together quite solidly. It’s a bit big to fit comfortably in the trunk of my compact car, and I have to take off two of the wheels to get it to fit. We actually wound up buying a Costco Wagon a week ago because it folds up much smaller, but I imagine you don’t have Costco in the UK either. You can find the Costco Wagon review by clicking on the Ballistic Racers header.